Dinner time!! And just to prove how yummy this dish was, I actually didn’t have to fight my kids to sit down and eat it. Maybe it’s because it has cereal in it, which is my kids favorite meal! But seriously, I think this is a great alternative to fried chicken. I love comfort foods that have a crunch, but I hate the calories! This way, it’s a good compromise. You still get the crunch and great flavor, but not the greasy calories. And I don’t know about you, but frying chicken at home always just turns out to be a huge mess. And I would consider the flavor of this chicken to be better. Not only does it taste healthier, but it’s refreshing. I don’t know whether to contribute the taste to the parsley, or the chives, or both? But it was amazing! And the butter/garlic stick you put in the center keeps the chicken super moist while also adding additional flavor. For sure a must try recipe! In a small bowl, combine the butter, chives and garlic. Shape into a 3 inch by 2 inch rectangle. Cover and freeze until firm, about 30 minutes. Flatten chicken to 1/4 inch thickness. 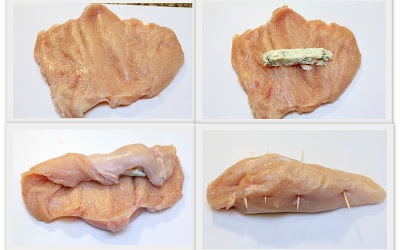 Cut the butter mixture lengthwise into six pieces; place one piece in center of each chicken breast half. Fold short sides over butter; fold long sides over and secure with toothpicks. In a shallow dish, combine the cornflakes, parsley and paprika. Place buttermilk in another shallow dish. Dip the chicken into buttermilk, then coat evenly with cornflake mixture. Place chicken seam side down in a greased 13 inch x 9 inch x 2 inch baking dish. Bake, uncovered, at 425 degrees for 35-40 minutes or until no longer pink. Remove toothpicks before serving. Serve over rice if desired.